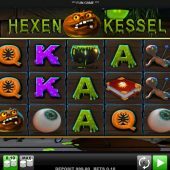 Hexenkessel slot quite literally translates as 'witches kettle' and indeed the grotesque and creepy prevails here over the reels and game. The background is a witches lair featuring candles and potions and the reels spin with an oddly out of place bass tune and some strange breaking noises when they stop. Merkur like their dark themes as we have seen with Hocus Pocus Deluxe and Vampires before, but will it bee all doom and gloom for our bankroll here? 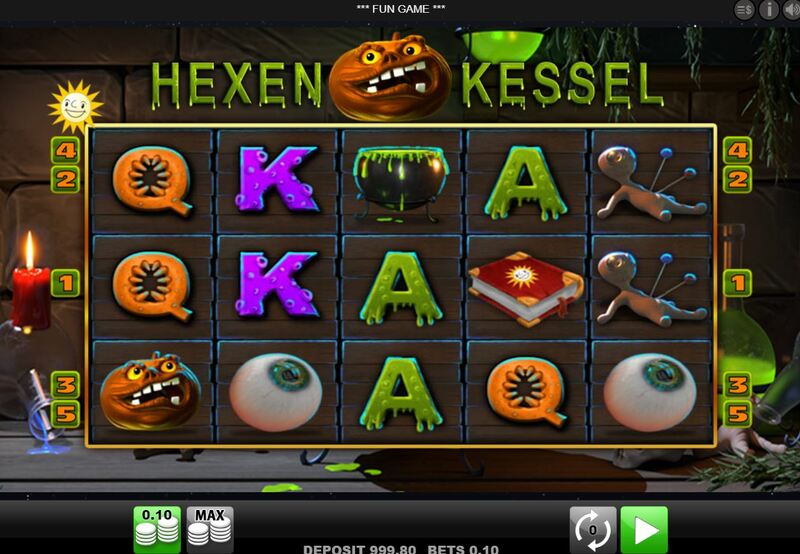 The Hexenkessel slot has 5 reels of 3 rows each and as with most Merkur slots, it's a quite basic game. We have stacked icons available on the reels and only 5 paying lines which may lead you to think it's highly volatile, but I'd say it's between medium and high. The pays for 5-of-a-kind wins are quite good as you'd expect with 5 line games and the Book which only appears singly is 1000x for a full line of 5, Cauldron 600x, Potion 500x, Shrivelled Pumpkin 400x, Eyeball 200x, Voodoo Puppet 100x with four card values A down to J at 80, 60, 30 and 15x respectively. Now Wilds and no scatters though, so when and how do the spells get cast here? Randomly the Shrivelled Pumpkin above the reels may transform into a Witch and she will skim across the grid as the bass music speeds up and overlay symbols with her likeness. If she leaves 6 or more behind you will get 6 or more free games in which the Book now becomes a Wild. There will also be a counter above the reels and starting with the lowest icon, the Jack, if you collect 15 on the grid you'll be awarded a cash prize and 6 further free games in which the next highest symbol Queen will be the collectable icon. The amount needed decreases as you progress, with only 12 Kings and Aces and 10 Voodoo Dolls or Eyeballs. It's hard to see the enhancement for getting these symbols as they remain on the reels but you do seem to see more Wilds as you progress.